tyntec are back and sponsoring TADSummit 2017! They’ve been shaking up the tired old A2P (Application to Person) SMS market in North America, first buying the assets from Iris Wireless of the peering agreement with Syniverse and SAP, one of only 3 contracts in existence. By bringing back competition to the interconnection market and introducing a new infrastructure built to support the rapid expansion of telecom API integration, tyntec is making it easier for carriers to open up for a broader range of innovative use cases. 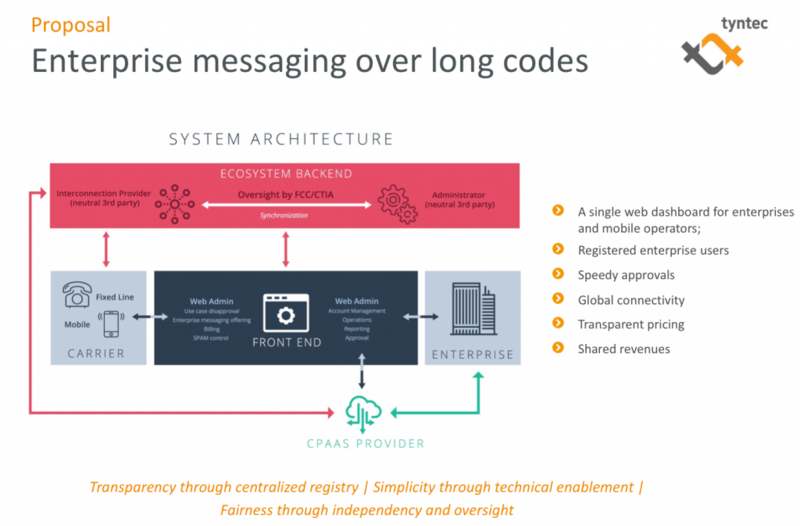 And secondly tyntec are proposing to address one of the dysfunctions of the US market by making long code A2P SMS work through a register, providing transparency to both mobile subscribers and enterprises, see image below. We’ll hear lots more about this in their keynote presentation, more details will be coming soon. “We’re excited to be back at TADSummit, and this klonopin prescription online time we’re sponsoring because there is no better place to meet the people building the future of programmable telecoms. Its open and frank approach enables us to quickly build partnerships to deliver our enterprise customers ever more advanced and high value services.” – stated Thorsten Trapp, CTO and cofounder tyntec. “TADSummit has focused on the enterprise applications of programmable telecoms since its founding in 2013, with contributions from industries such as Insurance, Finance, Banking, Call Centers, and Farming. tyntec also focuses on enabling businesses to communicate with their customers, workforce and machines using programmable Telecoms. I’m a fan of what tyntec are doing in the US market, and can’t wait to see their keynote and introduce them to many new partners and customers attending TADSummit.” – stated TADSummit’s founder Alan Quayle.